Home » Blog » Auto Insurance » How Do Glass Etched Codes Deter Vehicle Theft and Affect Auto Insurance? This entry was posted in Auto Insurance on 10/19/2017 by Alejandra Vazquez. When you’ve finally found the car of your dreams or bought your first new car, getting basic auto insurance simply isn’t enough to protect your investment. Deterring car thieves with visible and hard to break security features, such as VIN etching on the windows and other glass, goes a step beyond to keep your car in your driveway and free from damage. Spending a little money on having your windows etched also qualifies you for a discount on your insurance for car ownership for the rest of the life of the car. The details are sure to convince you to make the effort, either with a DIY kit or through a professional service. Glass etching is a simple process you can do at home or have done by the dealership before you take possession of a car. It involves etching the VIN number of the car into a corner of every window, windshield, and other piece of glass on the car. 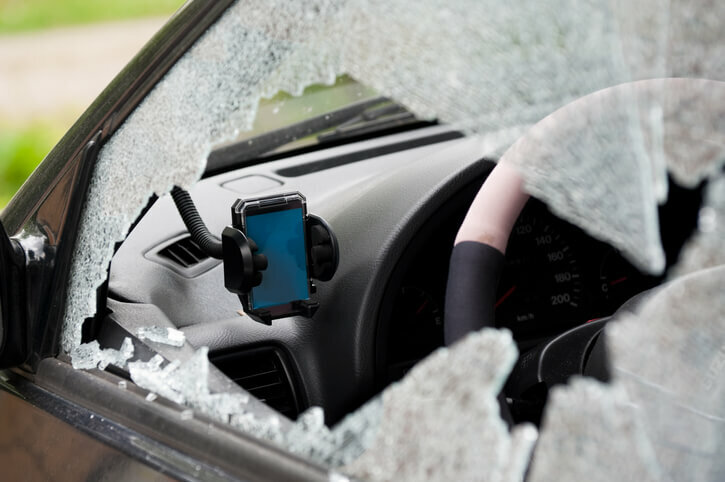 This means that if any of the glass is removed or the glass is disassembled, it’s still possible to track the car and determine the thief. It’s harder for car thieves to make money by either chopping a car or by stealing just the windows or windshield. Most of the best insurance providers ask about this feature, along with other common theft deterrents, when you first apply for a quote. You’ll notice a marked discount when you check the boxes for these kinds of optional upgrades. Why Does it Deter Theft? VIN etching is one of the most visible forms of theft protection available for vehicles. The visibility is why it’s such a popular theft deterrent recommended by auto owner insurance providers. Car thieves tend to casually check out your car as they pretend to tie their shoe or pick up a dropped item next to your doors. When they notice visible and permanent etching in all the glass, they’ll assume that you’re serious about preventing theft and catching them in the act. It’s a powerful mental deterrent that causes any criminal with common sense to move on to an easier target. Deterring theft is a lot easier than trying to track down your car and recover it before it’s broken down into parts. How Does Etching Affect Insurance for Your Car? Once you’ve etched the windows and windshield of your car and notified your auto insurance company, you can expect to see anywhere from a 5 to 15 percent discount on your next insurance period and for all future renewals. If you don’t like the amount of discount you receive from your current insurer, it serves as a good reference point to use to compare insurance providers against each other. What Else is Available as Theft Deterrent? For the biggest reduction in auto insurance rates, you’ll need more than just etched windows. GPS tracking units, etching on key parts under the hood, and advanced alarm systems also contribute greatly to discounts from your insurance company. Freeway Insurance offers discounts for etched windows as well as many other good driving habits and security features. Call us today at 800-777-5620 for a free quote or request a car insurance quote online.